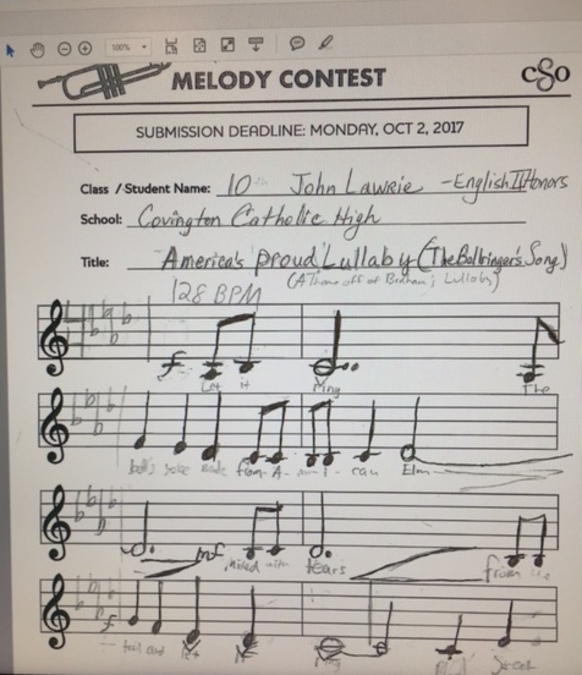 Lawrie's winning piano score -- "America's Proud Lullaby"
PARK HILLS, Ky. -- A Covington Catholic sophomore's dream is coming true Wednesday morning as the country's sixth oldest orchestra brings his composition to life at Cincinnati's Music Hall. 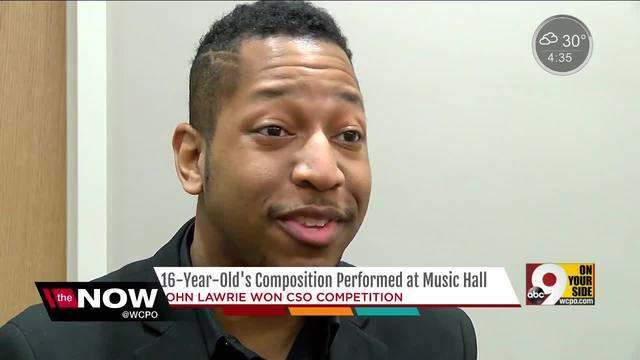 Sixteen-year-old John Lawrie will watch the Cincinnati Symphony Orchestra perform his contest-winning melody "America's Proud Lullaby" alongside his parents, siblings, English teacher and classmates at 10:30 a.m. Wednesday. “The whole class was excited. They get a field trip out of it,” Lawrie said. After Lawrie's teacher encouraged students to participate in the orchestra's Express Yourself Melody Contest as an extra credit assignment, Lawrie read local poet Mark Flanigan's poem "The Bell Ringer's Song" to inspire his melody. Lawrie has played piano for 12 years and said he drew inspiration from reading the poem's call for equality and justice. 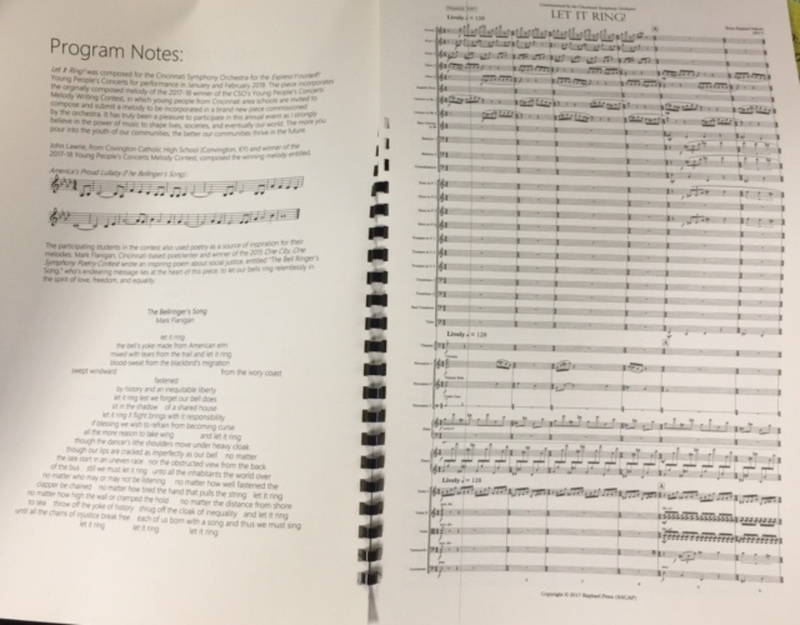 After Lawrie submitted his handwritten score for piano, Cincinnati Symphony Orchestra composer Brian Nabors selected it from all the submissions to be converted into a score for the full orchestra. Composer Brian Nabors converted Lawrie's piano score into a full orchestral composition. According to a news release, the orchestra has a history of commissioning and premiering new music by some of Cincinnati’s young composers. In 1942, the orchestra commissioned local composer Aaron Copland to compose a song that reflected hope as our country was at war. The well-known and triumphant “Fanfare for the Common Man” was the result of that commission. "This honor is incredible," said Stephanie Lawrie, John's mother. "Not many people get to hear a world-class orchestra like the CSO compose and perform a melody your son dreamt up. We hope he can use his talents to make a difference in the world." Associate Conductor Keitaro Harada will lead the orchestra in its premiere of Lawrie’s melody on Wednesday morning. Flanigan and Nabors will both be present for the performance. Read the poem that inspired Lawrie here .